Alfred Aholo Apaka was born in Honolulu in 1919 and died suddenly in 1960. His stunning baritone and good looks earned him the title of 'The Golden Voice of Hawaii.' He graduated from Roosevelt High where he was an athlete, singer, emcee and ROTC cadet captain. His family moved to Molokai but he and his sisters were shunned because their English was too good and the family moved back to Oahu. His father, Alfred A. Apaka, was also a singer and often performed with his son. The Royal's orchestra leader Don McDiarmid Sr. gave Alfred his first professional break, hiring him as lead singer. He next traveled to New York and performed at the Hotel Lexington with Ray Kinney. 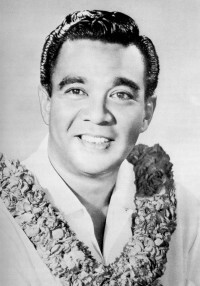 He returned to the Royal and was a featured singer on Hawaii Calls. That led to a regular gig with the Moana Serenaders at the Moana Hotel. He moved on to Don the Beachcomber's, where Bob Hope 'discovered' him and took him to Hollywood for his TV show. But most people first saw and loved Alfred during his long-running engagement at the Hawaiian Village's Tapa Room, a venue he opened in 1955 and where he played until his death. The Tapa Room is gone, but a statue at the Hawaiian Village commemorates his enduring popularity. He became one of Hawaii's best-known entertainers through his Decca and ABC records and his legacy continues to inspire other performers, including his son, Jeff Apaka. Some of Alfred's earliest recordings have recently been remastered in the CD Alfred Aholo Apaka: Hawaii's Golden Voice (Cord HOCD32000). One has only to listen to know why the day he passed away is known as "The Day Hawaii Cried." Biographical material from Tony Todaro, The Golden Years of Hawaiian Entertainment (Tony Todaro Pub., 1974), which is dedicated to Alfred.